Eggplant is one of the most versatile veggies there is. You can slice it thin and bread it for eggplant parmesan, turn it into a curry, pickle it, turn it into baba ganoush (Middle Eastern eggplant dip), or in the case of this dish, simmer it in Asian flavors and serve it with rice for a speedy meat-free meal. 4 Cups of Eggplant, rinsed, the tough stem at the top removed, and coarsely chopped – The eggplant you typically find in the grocery store is the Italian variety which is large with a dark purple, almost black skin. For this recipe, I used Asian eggplants, which are more cylindrical, somewhat inexpensive, and a paler purple than their Italian cousins. Use what’s inexpensive and easiest to find. 2 Heaping Tablespoons of Hoisin Sauce – Available in the Asian Foods Section of most grocery stores. A drop of Sesame Oil, Optional – I find this adds a nice toasted nuttiness to the dish, but my mother doesn’t use it when she makes this, so you don’t have to. 1 Green Onion, an inch from the top and the fuzzy bit at the end removed – Optional – This is more for decoration than anything, but since people eat with their eyes as much as their mouths (which is silly because eyes don’t have teeth or a tongue), a little colour contrast never hurt anyone. Sesame Seeds – Optional – For some reason people always get more excited about Asian-style dishes when they’re covered in these things, but they’re not necessary. 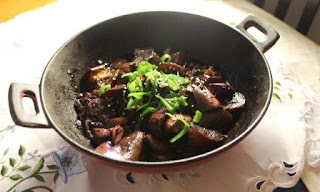 In a regular bowl, combine the soy sauce, hoisin sauce, and sesame oil (if using). Heat the vegetable oil in the wok or pan on high heat. Toss in the eggplant and stir every once in a while until the eggplant has shrunk a bit and absorbed some of the oil. Add the garlic and stir it all together until you can smell it (about a minute). Add the soy and hoisin mixture and the water and bring everything to a boil. Lower the heat to medium and cover the pan, lifting the lid every once in a while to stir everything and check for tenderness. The eggplant is done when it’s on the pleasantly mushy side (about 10 minutes). Be sure to taste it for doneness, but don’t forget to blow on it before tasting so you don’t burn your mouth! Top with green onions and sesame seeds if you wish and serve over rice.